A cask strength, single cask, ex-port cask from Tasmania’s much-loved Overeem whisky will be released as an exclusive expression at this year’s Sydney Whisky Fair. As we move to within one month of the event, we are delighted to confirm the release, which is the first Fair exclusive for 2017. It’s something of a full circle for the event, as The Oak Barrel bottled an ex-port cask Overeem as one of its first ever Australian Whisky Fair exclusives back in 2013. In that case, a 20 litre port cask was matured in store and offered in 200ml bottles. This time the cask we’ve selected, OHD-110, was a 100-litre port cask and will be offered in Overeem’s elegant 700ml bottles. Years of supply issues (read: zero stocks) have kept Overeem away from Sydney Whisky Fair, but we’re beyond excited to have them return in 2017. Particularly in such a significant way. The Overeem distillery began as a hobby for owner Casey Overeem, who commissioned a Hobart-made Knapp Lewer copper pot still and placed it in his garage. Some people put cars in their garage, other people put bars. Casey put a distillery. Production started in 2007, with Casey filling 100 litre ex-port and ex-sherry casks. 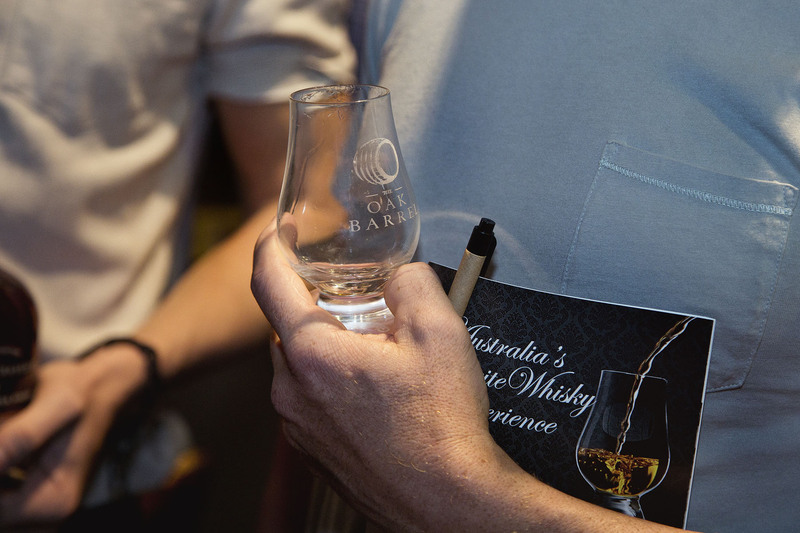 These came to maturation after five or six years, on average, and became one of Australia’s most cult-loved whiskies. They even made it across to the UK, where they were received rapturously. Part of the initial Aussie whisky push, when Lark’s Bill Lark, Limeburners’ Cameron Syme, Bakery Hill’s David Baker and Sullivans Cove’s Patrick Maguire were telling the story Australian single malt whisky, Casey and daughter Jane Overeem became much loved fixtures on the Australian whisky scene. A tough slog initially (“We make whisky in Australia?”) it was soon to be in a post-international award recognition world that demand for Overeem would quickly outstrip supply. Any period of time in the past that Casey decided to take some time off for a holiday was suddenly felt half a decade on, when both sherry and port cask expressions were unavailable for over a year respectively. In January 2014 Casey sold the Overeem business to Lark, the distillery his gold mate and Australian whisky Godfather Bill Lark had established, although the stills remained in his shed at the end of the driveway at their family home. After a period of planning and hand-over, the stills have now been moved and Overeem is now well-and-truly a sister brand to Lark. Excitingly for drinkers, the slow trickle of releases has started again. After robust negotiations (read: begging on our behalf) Overeem agreed to sell us the full cask of OHD-110 and bottle it at 60%. An ex-port cask, it yielded 120 (and three quarters) bottles. It has been labelled OBWF-2017 and the bottles are individually numbered from 1 to 120. OHD-110 was distilled on or about 6 May 2011 and settled 2 May 2017, making it just three days shy of six years old and right in that five-to-six year window of when Overeem expressions shine. We understand that this was distilled by Casey Overeem himself. The Oak Barrel are offering an exclusive pre-sale to members who wish to secure a bottle, as a thank you to their loyal support over the years. Bottles are now available to pre-purchase for $275 each, a discounted price for the pre-sale and the Fair itself. Only a percentage of the actual allocation will be available for purchase prior to the Fair. Head here to secure your bottle, which will be available for collection or dispatch the week of the Fair, which is week commencing Monday 21 August. SPECS: Cask OHD-110 labelled as OBWF-2017. Bottled at 60%, 120 bottles. PRICE: Pre-sale price of $275 each. AVAILABLE: For collection/dispatch last week of August.